Some people have been asking, how can I do more my predecessor? How can I be loved by my worker/colleagues? How can I become the best boss? How can I employ a vision team with mission? Although leaders are make not born, according scholars the best leaders are enthusiastically intellectual, innovative, and meticulous in speech. It is paramount to note that you can’t be a great leader without being a great follower and they are exceedingly self-aware. Clearly leading isn’t easy, but with the right set of skills, each of us can become someone others look to for guidance. These powerful people have proven they can successfully manage teams, companies, even countries. Here are some of their time-tested tips for being the kind of leader people are inspired to follow. Marc Benioff, the founder, chairman and co-CEO of Salesforce, believes that growing a company should never be the top priority: establishing trust with your employees and consumers is more important. “Never put growth before trust. If you put growth above trust, then all of a sudden you create a toxic culture. People don’t want to work in that environment or use the product,” he said in an interview with the New York Times. He’s seen the backlash and consequences of the growth-first mindset. At the Wharton School of Business’s 2018 People Analytics Conference, Mary Barra, CEO of General Motors, emphasized the importance of asking your staff questions like, “Did you get what you needed from this meeting?”, and, “What’s your opinion?” Leaders continue to improve when they draw on their employees’ on-the-ground knowledge and experiences, she explained. “To create new businesses and drive growth, you need to have a leader who wakes up wanting to make an impact,” Shantanu Narayan, President and CEO of Adobe, explained to his business school alma mater, Berkeley Haas. For him, that impact means to “empower everyone from emerging artists to global brands — to bring digital creations to life and deliver them to the right person at the right moment.” But whatever your industry or position, to lead effectively, you need to care about what your team is working towards. 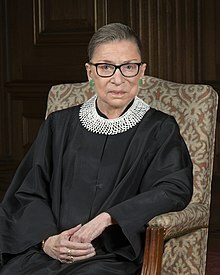 Ruth Bader Ginsburg got some great advice from her mother-in-law, which she says she has applied to everything from her marriage to her role on the Supreme Court: It helps to be a little deaf sometimes. “When a thoughtless or unkind word is spoken, best tune out. Reacting in anger or annoyance will not advance one’s ability to persuade,” she wrote in a New York Times opinion piece. Jeff Bezos, Amazon’s founder and CEO, believes that a meeting should never include more mouths than two pizzas can feed, his biographer Richard Brandt revealed in a Wall Street Journal profile. A good manager should keep teams to that two-pizza size, a piece of advice Bezos put into practice as company policy at Amazon.